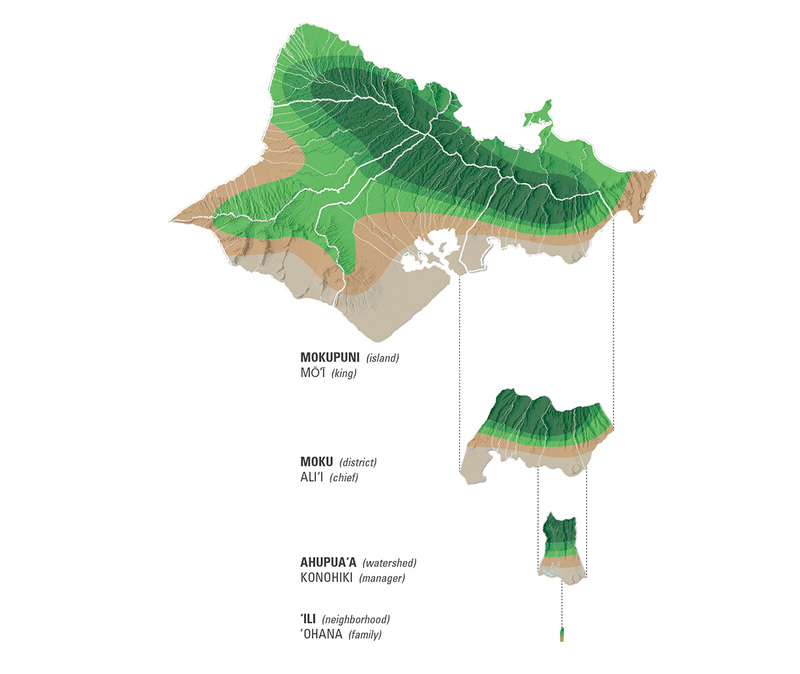 What are the typical boundaries of an ahupuaʻa? Why is the Hālawa ahupuaʻa such a fertile place? An ahupuaʻa has plentiful resources for the whole community. What are some of the resources in your families and classrooms? Which resources can be found in the ocean, and which can be found in the streams and valleys? What does Kawaʻa mean when he says, “Hawaiian wealth is based on water”? Who are some people you could ask to learn more about the name and resources of your ahupuaʻa? He hānai aliʻi, he ʻai ahupuaʻa. The rearing of a chief is the ruling of an ahupuaʻa. A person in whose care a young chief was placed was often rewarded with a large tract of land. Where do you live? If you answered Waiākea, Kaunakakai, Nānākuli, or Hanapēpē, you named an ahupuaʻa! If you live somewhere in Hawaiʻi, you live in an ahupuaʻa. Many ahupuaʻa names that are hundreds of years old are still in use today. An ahupuaʻa is a section of land. Our islands are made up of several ahupuaʻa. The borders of each ahupuaʻa usually follow natural boundaries, like mountain ridges or streams. Ahupuaʻa can stretch from the mountain ridges to the coral reef system. Ahupuaʻa vary in size. Some are as small as 100 acres. Others are as large as 100,000 acres. Each ahupuaʻa has the necessary foods and materials for ʻohana (families) in that area to live comfortably. Why do we have ahupua‘a? A long time ago (about the fifteenth century) there lived a great chief named Māʻilikūkahi. He lived on the island of Oʻahu. During the start of his reign, there were no land divisions. Food was limited, and chiefs argued with each other over land rights. Māʻilikūkahi was a kind and generous chief. He wanted to ensure that the people had enough food and materials to live comfortably. He wanted to bring order to the people and the land. Māʻilikūkahi commanded his chiefs to survey the island. Then he had them mark the boundaries for each division of land. The island of Oʻahu was first divided into moku (large districts), then further into ahupuaʻa, and even further into smaller tracts. By organizing the land and the people into different groups and subgroups, Māʻilikūkahi improved the livelihood of his people. The land and the people could be even more productive. The resources could be more plentiful and would last long into the future. The Hawaiian Islands are a pae moku, or group of islands. Each individual island is called a mokupuni. A mokupuni is divided into moku, or districts. Kona on Hawaiʻi Island is a moku, and so is Nāpali on Kauaʻi. In some places, there are two more land divisions before you get to the ahupuaʻa level. And the ahupuaʻa can be divided into even smaller land divisions. How was the ahupua‘a successful? 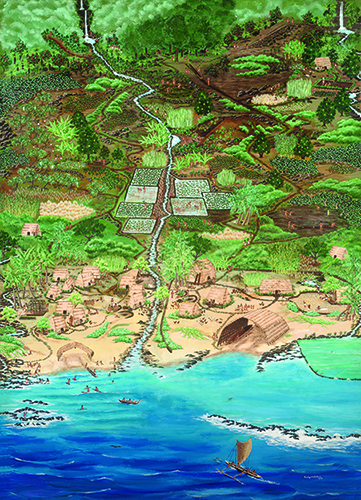 The ahupuaʻa was a self-sustaining unit. With proper management of the ahupuaʻa, the needs of its inhabitants could be met within its boundaries. Everyone had access to the resources they needed to live well. What they couldn’t make or get themselves, they could get from others by trading. Resources that were limited were conserved and placed under kapu to be available in the future, like the kapu placed on certain fish during their reproductive season. The people thrived and the land thrived. Land use was determined by the land. Upland areas that could grow tall, strong koa trees for canoes remained forested. The fertile valley floor surrounding a stream could be made into agricultural ponds for growing kalo. River mouths emptying into calm bays could be incorporated into fishponds. Māʻilikūkahi insisted that his people mālama ʻāina (care for) the land. His reign brought peace to the land. “Cultivate the land, raise pigs and dogs and fowl, and take the produce for food. And you, chiefs of the lands, do not steal from others or death will be the penalty. The chiefs are not to take from the makaʻāinana. To plunder is to rebel; death will be the penalty. This is my command to the chiefs, the lesser chiefs, the warrior chiefs, the warriors, and the people" (Kamakau 1991). How were land boundaries marked? In some places, natural features marked the boundary. A large rock called an outcrop might be a natural marker. A row of trees or a stream channel could also serve as a natural marker. Some ahupuaʻa boundaries were known as home to a certain bird. Artificial features (something made by humans) marked the boundaries of other ahupuaʻa. Many ahupuaʻa used a wooden pig’s head carved from the trunk of a kukui tree (Mitchell, 1969). The wooden head was placed on an ahu (altar) of stones. This marker was one way people knew they were leaving their own ahupuaʻa and entering another. These days we have a different kind of artificial marker—a street sign—that tells us when we are entering a new ahupuaʻa. Māʻilikūkahi assigned high chiefs to each of the six moku. They were called aliʻi ʻai moku. The people who ruled over the ahupuaʻa were the aliʻi ʻai ahupuaʻa. It was their kuleana (responsibility) to make sure the ʻāina was productive. The konohiki (land steward) were involved with the day-to-day operations of the ahupuaʻa. They were a lesser rank of chief called kaukaualiʻi. The konohiki were usually related to the chiefs of the district or even the aliʻi nui (high chief). The konohiki supervised the activities of the fisher and farmer. The smaller parcels were each assigned to kaukaualiʻi. The makaʻāinana became stewards of the ahupuaʻa where they lived. Their hands worked directly with the land, and so their work was very important in the health and wealth of the ahupuaʻa. Each ahupuaʻa was given a name. 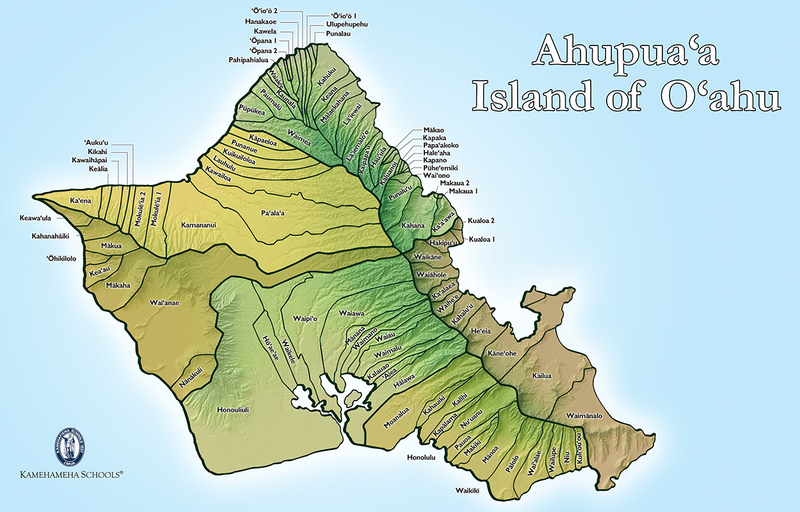 Land divisions bigger and smaller than ahupuaʻa were also given names. Loʻi kalo (taro terraces) and fishponds had names. The aliʻi knew the names of each. They understood what each name meant. And they memorized each piece of land and its location. A place might be named for a characteristic of the land, a famous inhabitant of the area, or its most important resource—water, like the many places that begin with the word “wai.” The ahupuaʻa of Waimea on Oʻahu is named for the red (mea) dirt that flows into the stream after heavy rains. Our kūpuna harvested from their own ahupuaʻa. They didn't take the resources of another ahupuaʻa. They knew their ʻāina best and would not want to mahaʻoi, stick their nose, elsewhere. If something was scarce or unavailable in their own ahupuaʻa, our kūpuna would trade with others. For example, the ahupuaʻa of Waipiʻo used to produce a surplus of kalo but didn’t have good fishing grounds. So they would trade their kalo for fish with the moku of Hilo and Kohala. 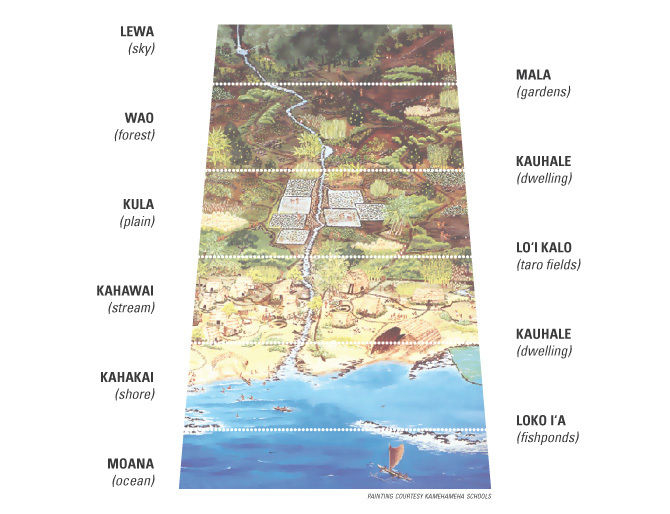 While the traditional names of some ahupuaʻa and other land divisions are still in use today, some have been replaced by modern names that don’t always take into account the ancient moʻolelo and knowledge of the land. Some ahupuaʻa are now called towns, and some ahupuaʻa have been lumped together with more well-known ones. For instance, much of “Kāneʻohe town” on Oʻahu now includes part of the ahupuaʻa of Heʻeia, including Windward Mall. Before Kāneʻohe became a town, it was an ahupuaʻa in between Heʻeia and Kailua. People don’t necessarily work in the ahupuaʻa where they live. Many commute to urban centers where there are more jobs, like Honolulu. But affordable homes and land are miles away from the urban center, creating traffic (and sometimes road rage) in and out of the city. People are spending more time on the road and at their work place than in their own neighborhoods. This disconnects us from the land and our community. We are spending less time with our ʻohana—the human kind and the land kind. The less involved we are with our own ahupuaʻa, the less we can help to mālama its resources. The less we mālama its resources, the less our ahupuaʻa can sustain us. We are already dependent on other ahupuaʻa and even other countries for our water, food, and material needs. A return to the ahupuaʻa live-work system would allow us to strengthen our community resources and better provide for the future of our home and all who live on it.